The school year is quickly coming to an end. We would like to thank you for allowing us to be an important part of your child’s early education. 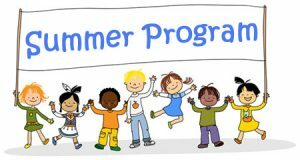 Our Summer Camp Program will begin on June 25, 2018, and end on August 16, 2018. Our theme-based program enables the children to explore a variety of topics. Field trips to various interesting destinations planned for the Pre-Kindergarteners and Kindergarteners enhance our program. Summer is a great time to have fun and review lessons from throughout the academic school year. Our goal at Tiny Tot Preschool & Kindergarten is to equip each child with a strong academic foundation, encourage good character and values, and strengthen socialization skills. We continue to help the children develop social and emotional skills and introduce more cognitive and academic activities in these classes. Dividing the summer into weekly themes, the teachers plan art & craft projects, music, literature, science, cooking and baking, and field trips to support each theme. Arts and crafts are an important part of the program. We firmly believe that through this the children enhance their fine motor skills, begin the process of learning to write, and use their imaginations in creative ways. Our sand-covered playground is an important part of our learning environment. Weather permitting; the children use the playground every day. To stimulate gross motor development, we have a variety of climbing, riding and sports equipment on the playground. Through these activities, the children also learn to take turns and play cooperatively. At the same time, we stress cognitive and readiness skills. Through developmentally-appropriate small group work, individual instruction, and circle time (teacher-directed instruction), the children develop early literacy and mathematics skills including letter recognition, phonemic awareness, writing, speaking, and arithmetic. We teach the alphabet and numbers systematically, using a variety of approaches to accommodate each child’s individual learning style. As summer approaches parents will be given detailed information about the daily activities. We look forward to having a fun-filled summer with your child(ren)! This entry was posted in Events, Information and tagged affordable child care simi valley, Kindergarten summer Camp, Simi Valley best school, tiny tot preschool & kindergarten, Tiny Tot Summer Camp, toddler care, ttpk. Bookmark the permalink.